A look at the SpaceX Dragon vehicle that will undergo a crucial pad abort test in early 2015. A crucial safety test looms for the crew-carrying version of SpaceX's Dragon capsule, which NASA hopes will be ready to fly astronauts to and from the International Space Station by 2017. 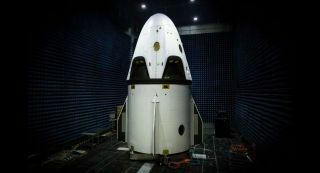 In the next few weeks, SpaceX will ship a Dragon test vehicle from its California headquarters to Cape Canaveral Air Force Station in Florida, NASA Administrator Charles Bolden said Monday (Feb. 2). In Cape Canaveral, the spaceship will undergo a critical "pad abort" trial, which will show how Dragon might respond if a problem were to occur during launch. SpaceX technicians work on the Dragon vehicle that will undergo a crucial pad abort test in early 2015. During the unmanned pad abort test, Dragon will sit atop a truss structure rather than an operational SpaceX Falcon 9 rocket, former astronaut Garrett Reisman, head of SpaceX's commercial crew program, said last August during a presentation with NASA's Future In-Space Operations working group. If everything goes according to plan, Dragon's thrusters will kick on and lift the test vehicle away from the launch pad. "We're going to have a crash-test dummy inside and a prototype seat, so we'll get data from that," Reisman said. "We're going to have a very flightlike propulsion system as far as everything that goes into the abort, including the avionics, which are going to be identical to the avionics we plan for the flight vehicle." SpaceX also plans to do an in-flight abort test, in which Dragon will be lofted into the sky by a modified Falcon 9, from Cape Canaveral sometime after the pad abort trial. In September, NASA awarded SpaceX $2.6 billion to get Dragon ready to fly astronauts. (A robotic version of the vehicle already carries cargo to the space station for NASA, under a separate $1.6 billion resupply contract.) The space agency also awarded Boeing $4.2 billion to complete work on its crew-carrying CST-100 capsule. NASA hopes one or both of these private spacecraft will be up and running by 2017. Since the retirement of the space shuttle fleet in 2011, the agency has been dependent on Russian Soyuz vehicles to carry its astronauts to and from the International Space Station, at a cost of more than $70 million per seat under the latest contract.